The Ramblings of a Mellow Yellow Fellow. I licked, therefore I won. To those who have never been to SXSW Interactive, it is a crazy, crazy scene. Thousands of people everywhere down by the Austin Convention Center. There were almost 20,000 badge holders this year. If you include people like me, who were just there for the spectacle of it all, there might have been close to 23,000 people there. This year, I went to SXSW Interactive badge-less. Due to a heavy workload in the months leading up to this year's SXSW, I decided it wasn't going to be worth it to get a badge, especially since I wasn't going to be able to make it to many sessions. Based on my experience from last year, a lot of people at SXSW are there mainly for networking purposes and could care less about the panels. There is a lot to do and see during SXSW Interactive, even if you don't have a badge. From the Apple pop-up store to the cheap/free food, there were still a lot of compelling reasons to try to make it downtown this year. And, by the end of this post, you'll see that I stumbled upon another great reason to fight the crowds and hassle and get to SXSW Interactive, with or without badge. In recent years, SXSW Interactive has become the place to announce/debut the latest/greatest app. Twitter arrived on the scene at SXSW in 2007, while Foursquare made their big splash in 2009. As a result, now every up-and-coming company tries their best to tap into the SXSW vibe/zeitgeist in hopes of achieving the same results as Twitter and Foursquare. 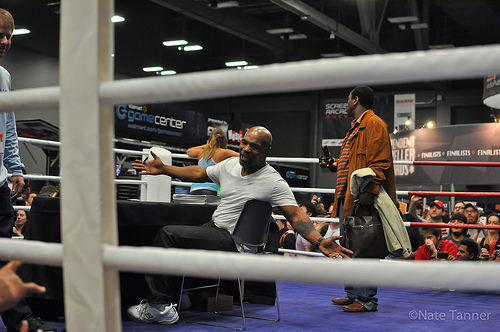 I made it down to the Austin Convention Center around 2pm on Saturday, March 12. 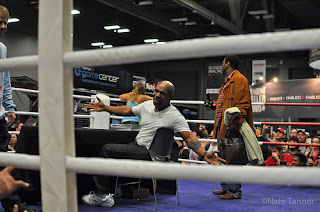 I had read that Mike Tyson was going to be making an appearance at Screenburn to debut his new iPhone app, and thought that would be as good a place to start as any. I grew up watching the rise and fall of Iron Mike, and thought it'd be neat to see him in person, maybe even get a photo with him, nibbling on one of my ears. Apparently, not only has he turned over a new leaf, but he's also turned into quite the renaissance man! When not developing iPhone applications, he's busy raising racing pigeons. He also helps people break their Angry Birds addiction, so if you fall into that category, give him a call! Unfortunately, I got the days wrong, and he wasn't scheduled to appear until the following day. I was disappointed at first, but it turned out for the best, as it seems his appearance drew a large crowd the next day. After that, I dropped by the Circus Mashimus lounge and chatted with a couple of developers from Lulu.com. They offer a very cool Publication API that allows you to create your own web applications as well as publish your own books. They were running a contest. To enter, you just had to publish an eBook through their API. 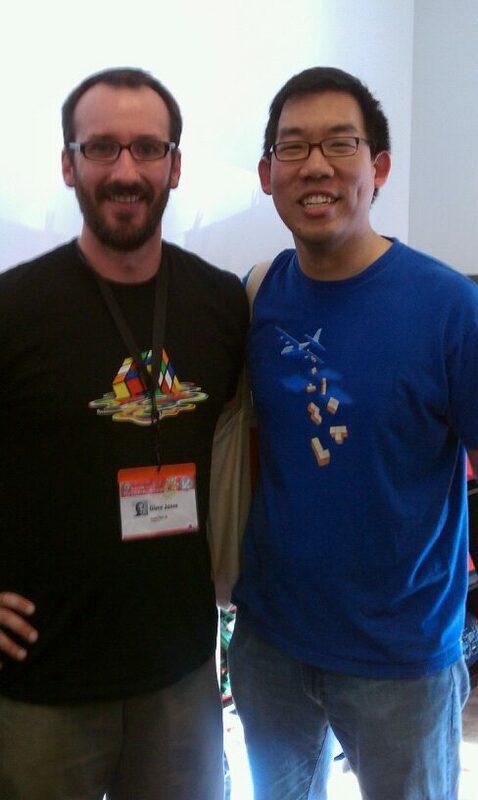 Gavin from Lulu and Ben, a developer who has used the Publication API to create Before I Grew Up both encouraged me to enter the contest. At that time, there hadn't been many people who took up the challenge, and they told me my odds at winning would be pretty good. They attributed it to most people were busy networking or partying, and not really interested in doing much else besides that after a long day traipsing around the Convention center. So after I got home that night, I went ahead and entered the contest. The Publication API was as easy to use as advertised. (If you're looking for an easy to use open-publishing platform, this is it.) It took me less than 30 minutes to complete the task, and I was done. I didn't think much else of it at the time and soon after that, met up with some other badge-less friends and went exploring outside the Convention Center. That's when we ran into a tiger, parrot and jungle keeper/balloon artist who were letting people know about the Socialcam Challenge. Sponsored by Socialcam, Hipmunk and AirBNB, the grand prize was a trip for two to a private island! While intrigued by the prize, I didn't think much else of it at the time, as we were hungry and looking for free food. That being said my friend Vina got a very cool balloon hat from the jungle keeper! While I was not familiar with Hipmunk or AirBNB before this encounter in the street, I had heard of Socialcam, due to my coworker Chris Cain (aka Captain Internet, for his ability to find the most random things online). From the folks at Justin.tv, Socialcam officially launched on March 7, and was referred to early on as the "Instagram for Video". The goal of the application is to provide an easy and simple way to upload videos from your phone to then share on Facebook, Twitter, and elsewhere. The week before SXSW, Chris was aware that I was thinking of going to badge-less, and suggested I should use the Socialcam app to broadcast my upcoming escapades. I thought that wasn't a bad idea at the time, and so I installed it onto my HTC Evo. Based on a brief test, it seemed like a pretty cool app, but up till that point, I hadn't done much with it. While waiting for the jungle keeper to finish his masterpiece, I remembered I had the app installed, and decided to test it out again. 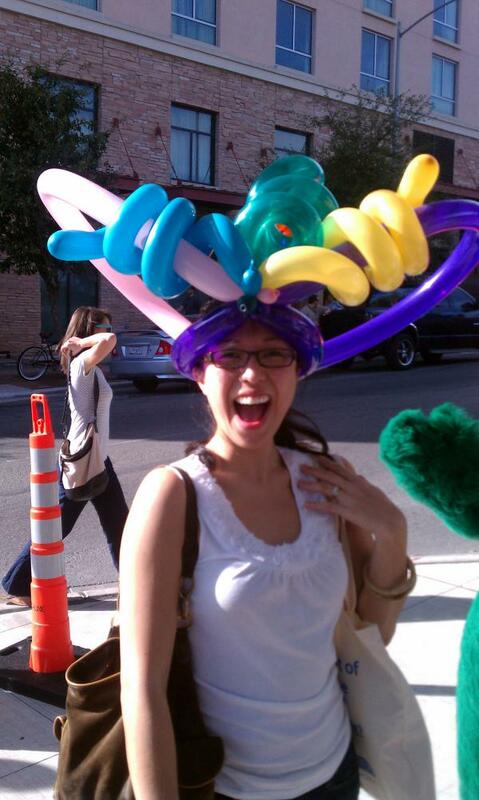 The app worked fine, but I didn't think the video I recorded of the making-of-the-balloon-hat was worth uploading and promptly deleted it. 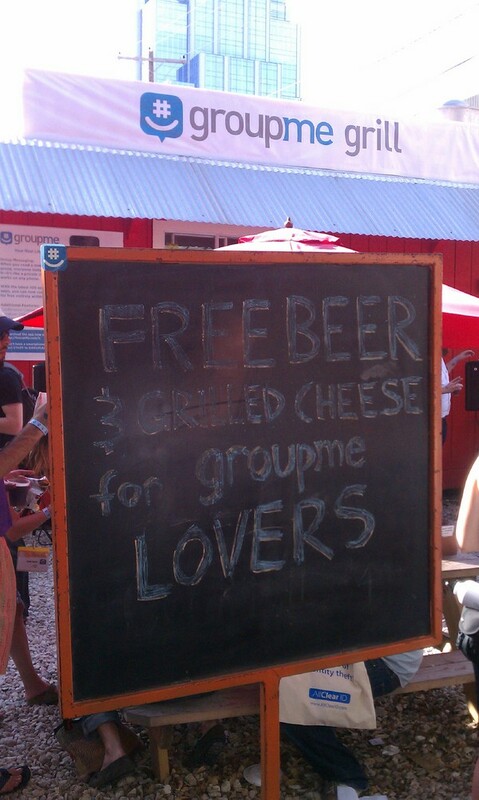 By this point, we were all really hungry, and thankfully found the free grilled-cheese sandwiches being given away by GroupMe. After that, we walked past the Glennz Tee's pop-up store, and we decided to pop-in (hah!). I've actually been a fan of Glenn's work for awhile now. He's a great artist and his designs are very humorous and clever, without being obscene. I was actually wearing one of his t-shirts that day and proudly showed it off to one of the guy's staffing the store. He then asked me if I would like to meet the man himself! I said of course, and out came Glenn! I told him how much I liked his work, we talked about some of his more recent designs and he told me that the store was doing well, and he seemed happy to meet someone who appreciated his work. After the obligatory photo with Glenn, we left the store to continue our quest for more exciting things to do. We hadn't gone far when one of the Glennz Tee's employees came out and handed me a couple of shirts, courtesy of Glenn. This whole experience has pretty much cemented Glenn's position at the top of my list of t-shirt designers. Do yourself a favor, and go buy yourself a tee from Glenn! After that, we stopped by the Pepsi Max Stage/Lot, played some actual foursquare (sponsored by the folks from Foursquare), grabbed a few free drinks, and then decided to call it a day. I was satisfied with the day's events to feel like that was enough SXSW 2011 for me, and didn't go back on Sunday. On Monday, I was at work when I found out via this tweet from Lulu that I had won the their api contest! I had one of my friend's who was still at SXSWi that day (SXSW Interactive ran through Tuesday) pick up the the prize for me. 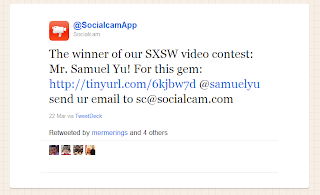 The fact that I won actually reminded me of the video contest by Socialcam. I went ahead and visited the Socialcam Challenge contest page again, as well as viewed some of the other entries that had been submitted. The fact that I wasn't impressed by any of the entries up to that point (kissing the tiger, really?) made me think I still had a good chance of winning the contest, if I could just come up with a clever enough idea. Out of the above challenges, to me, the one that is inherently the most funny, is licking something. Thanks to countless viewings of A Christmas Story, and the fact that I always cringe and laugh when I see the above scene with Flick, Ralphie and the frozen pole, I decided that was the challenge I should go for. Since I didn't want to involve the fire department, I knew I had to lick something that was less hazardous to my health, but funny and relevant at the same time. That was when the light bulb went off, and I thought, "iPad 2!" It wasn't that hard really to think of it, since it had just come out and was in the collective geek/nerd consciousness. I think just about every article in my Google Reader made some mention of the latest and greatest must-have gadget from Apple, and so it was definitely on my mind. I went to bed that night, knowing that I had the general idea for what could be a decent video. The next day, Tuesday March 15th, I woke up, unsure of my idea and whether I should proceed with it. It would actually be quite convenient, since I work within a 5 minute walk from an Apple store. 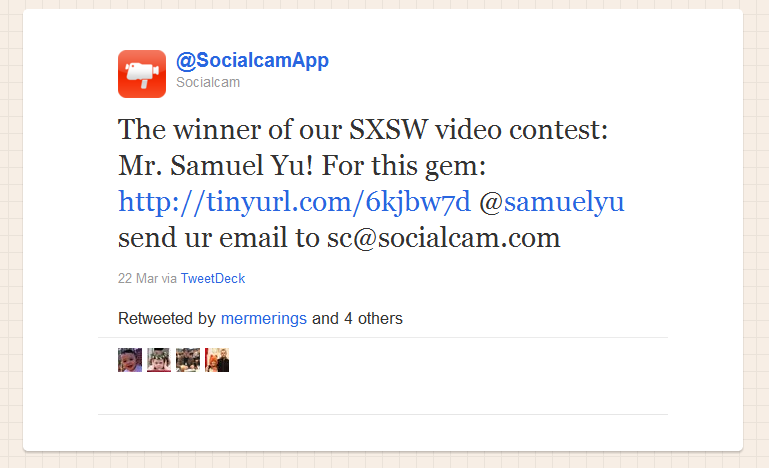 I went ahead and asked the Socialcam folk via Twitter whether it was worth entering the contest still. See their reply here. Based on that encouraging tweet, I asked a couple of coworkers if they could assist me with a non-work related task during lunch. The first person I asked who agreed to do it ended up being unavailable, which was quite fortuitous, since the other person turned out to be the best videographer/producer/partner-in-crime I could have hoped for. When I told Jonathan what I was planning to do, he thought it was a great idea, and we immediately started bouncing ideas off each other. Jonathan actually came up with the catchphrase I use at the end of the video. By the time we walked over to the Apple store, we had formulated a plan. Since neither of us had actually seen the iPad 2 yet, we decided that we would first go in, check out the iPad 2 and the store layout, do a dry run of the video, then leave the store and come back and actually record it the second time. I don't think Jonathan expected me to actually go through with both the licking and the shouting, "I licked it, it's mine!" at the end. Thankfully, he was able to keep recording through his giggling fits. I was also surprised at the lack of reaction from the people in the store. I guess people have come to expect crazy shenanigans in the Apple store these days. My stunt seems pretty tame by comparison. Jonathan and I returned to the office, pleased with our "accomplishment". One of the cool things about Socialcam is that it uploads the video as soon as you are done recording it, so the video was already up on the interwebs by the time we returned to the office. That same day, I found out that the folks at Socialcam liked my video, via a tweet, going so far as to declare my video "awesome". Since the contest ended that night, I thought to myself that was a pretty good sign. In the meantime, Jonathan went into full "PR" mode and started tweeting the link to the video. As you can imagine, I jumped up and down with glee, to the surprise of my coworkers sitting nearby, then ran over to inform Jonathan. He was genuinely happy for me, and to his credit, did not immediately ask to accompany me to Fiji. For the rest of the day, it was pretty difficult to concentrate at work, I must admit. The entire video contest turned out to be a great success for Socialcam as well, as described in this Mashable piece that came out the next day, entitled "Man licks Ipad 2, Wins Trip to Fiji". They created a lot of interest in their app with the contest, and had around 150,000 new accounts created during SXSW. Whew, after this long recap, I think I'll just end this blog post with a tweet from my friend upon hearing the news that I won the contest. 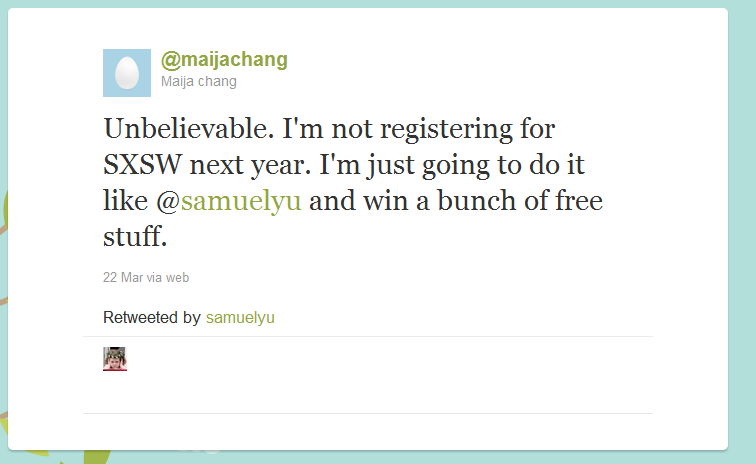 Moral of the story: go to SXSW next year, and enter every contest you can. Who knows, you just might win yourself a trip to a deserted island, and in the process, make your spouse very, very happy. PS. I think I started a new fad. This past Saturday, I spent the day with 500 "thought leaders, entrepreneurs, scientists, performers and innovative doers" at TEDxAustin 2011. To those who are unfamiliar with TED, it's basically a gathering of thought leaders in the technology, entertainment and design fields, with the stated mission of spreading ideas. The annual TED conference held in Long Beach, California costs $6,000 to attend and it's not an easy ticket to get. Due to the high cost, and the very successful people who get invited to attend, TED has been accused of being elitist. One way TED has tried to counter that accusation is by releasing all their presentations online. Like many of you, this was how I was first introduced to TED. There are now many TEDx (local, self-organized events that bring people together to share a TED-like experience) conferences held around the world. Austin had it's first TEDx gathering last year, at the former Austin City Limits studio, with an invited audience of 300 people. They doubled the size this year (as well as doubled the cost to attend, from $50 to $100) and hosted it at the Austin Music Hall. With that rather lengthy explanation, this will be my attempt to recap what I experienced at TEDxAustin 2011. The Digital Savant has already done a fantastic job of reviewing the event, so there's no need for me to get into as much detail. I'll just use this opportunity to review my thoughts about the day. 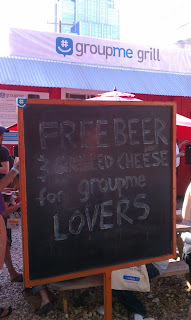 First thing I'd like to mention is that I'm not sure how I got accepted to attend this rather exclusive gathering. Note in my first paragraph I didn't write "500 OTHER thought leaders, entreprenuers, scientists, performers and innovative doers" because that would imply I'm one of the above. While I wish that were the case, the truth is much more boring - I'm just your average modern day internet professional, with a minivan, 2 young kids, and an awesome wife who agreed to let her husband spend the entire Saturday at this event. Registration and breakfast began at 9am. The breakfast bar consisted of yogurt, granola, muffins and bread. It was literally a breakfast bar, as the food was served on the downstairs bar, under very dim lighting. During breakfast I was able to meet a few people, who all had varied backgrounds. From the wind engineer to the director of a radio station to the software engineer at the Workforce commission one thing they all had in common was that they were quite excited about TEDxAustin, and had high expectations for the day. I also had very high expectations for the day, just based on my experience with TED and the quality of the talks that I've watched before online. And I think that was the reason why I walked away from TEDxAustin 2011 a little disappointed. I think I set the bar a bit too high, and what I was hoping for probably wasn't even possible. My hope was to walk away from the day full of inspiration, motivation, and a desire to take action on great ideas. And while many of the speakers presentations were inspiring, controversial and even tear-inducing, I don't know how well they addressed the topic of TEDxAustin, which was "Right Now". As in, what can we do "Right Now" to cause change, to act, to do something, anything. I heard a lot of grand ideas, but not much practical application, or handles. Regarding the actual production and organization of the event, it was first-rate, all the way. I walked away with a tremendous amount of respect for all the work that went into organizing and producing such an event. From the well-designed handouts, to the seating area, surrounded by black curtains, and referred to throughout the day as "the black box", it was very, very well-done. This was demonstrated by the opening musical performance by Mother Falcon, a local Austin "pop-chamber orchestra" group, consisting of mostly teenagers and 20-somethings. It was a great opening act, and they sounded great. So great in fact, that I'm considering taking my wife to see them this Sat at their new cd release concert. The first speaker of the day, Sunny Vanderbeck, a venture capitalist with Satori Capital, gave an excellent presentation on sustainability and conscious capitalism. A few choice quotes - "Business has lost its way." "Purpose - the nonfinancial reason for existence." "Capitalism is the most powerful force in the world. Want to change the world? Change capitalism." Besides having the most well-designed slides of the day, he also had one of the clearest presentations, and made the entire topic of conscious capitalism easy to understand and grasp. He was followed by Dr. Ralf Wagner, who spoke on synthetic biology, aka genetic engineering. Unfortunately, Dr. Wagner wins the award for most poorly-designed slides of the day. His topic, while definitely an interesting one, was also chilling to me, in its implications. He stated from the start that he and his company Gene Art were not interested in "playing God", but yet later on he had a slide that showed a three-eyed frog, framed in a positive light. His talk piqued my interest again when he showed pictures of algae farms and described how these could be harvested as an alternative engery source, and turned into biodiesel fuel. After that we were shown a talk given by Britain's Prime Minister David Cameron last year. I've embedded it below, and it's definitely worth watching sometime. This was one of the three TED talks that were recorded from other TED gatherings and that were shown to us throughout the day. All three of these talks were excellent, but I question the wisdom of showing these recorded talks, for the following reasons - 1. In hindsight, all three talks were better than most of the live presentations given that day, and thus it seems to diminish the value of the live speakers 2. The recorded sessions came across as time-fillers, as in, "we couldn't find another speaker, so here's a great session from somewhere else!" 3. I'd never seen those three talks before, so they were new and fresh to me, but I'm sure others in the audience had seen them before, so there was less value for them to see them again. Update: Stacy Weitzner informed me that TED requires that recorded talks be shown as a part of every TEDx event. After the Cameron video, Robyn O'Brien , aka "the Erin brockovich of food" gave a moving presentation on how she became a food advocate. A reaction that one of her kids had to a food product caused her to ask this question - "How can children be allergic to food?" She started doing research and found evidence that the food industry and the government started allowing genetically modified food to be introduced into the US food supply without adequate human testing. It was interesting how Robyn's anti-genetic engineering talk came soon after Dr. Wagner's presentation on the benefits of genetic engineering. Maybe that's why the organizer's decided to show us David Cameron's talk in between, as a sort of TED-buffer. O'Brien's presentation also received the first standing ovation of the day as well. While her story is moving, I was disappointed that she didn't present any real suggestions, besides buy organic food, even though it costs more. The next speaker was in my opinion, the most inspiring of the day, which looking back, is not good, since we were still in the morning session. Gilbert Tuhabonye was almost killed as a young boy in Burundi. His message of forgiveness and living your life with joy was quite touching. The group he founded, Gilbert's Gazelles, now helps raise money to bring clean water to Africa. He also received a standing ovation, deservedly so. After Gilbert's speech, we broke for lunch, which consisted of a sandwich meal from Whole Foods, which was served upstairs. The line was long, but moved quickly. This was where I first saw the amazing photographic work of Esther Havens. She calls herself a humanitarian photographer, and rather than show the typical "starving child in Africa" photo, she tries to "capture stories that transcend a person's circumstance that reveal the strength of an individual regardless of the situation in which they find themselves". If you take a look at her work, I think you'll agree she does a great job of it. The second session after lunch had some very good presentations - Osama Bedier spoke on the future of payments and how the size of two horses behinds were the reason "behind" the limitation of one of the greatest modes of transportation of all time, the space shuttle. It was a great demonstration of how much we are constrained by the past. Sylvia Acevedo, an education advocate, discussed how Texas is one of the few states (along with California and Florida) that is experiencing a baby boom, and how this will either be a tsunami that wipes us out here in Texas, or a wave of opportunity, similar to the nationwide baby boom of the 40s and 50s and how it ushered in unprecedented times of prosperity. Her main points were 1. Get informed 2. Be proactive, not reactive 3. Choose your line (choose where you want to go), choose your future. Gregory Kallenberg, the director of the award-winning documentary Haynesville spoke next. He spoke on behalf of the "rational middle" in the energy debate. He stated that energy is really, really complicated, and as such requires a solution that includes the use of all energy sources, including the one in Haynesville, to buy us time before a real lasting solution can be found. After Kallenberg's presentation, there was a strange jump to the Intergalactic Nemesis, a live action graphic novel presentation. I'm a big fan of comic books and graphic novels, and it was neat seeing them perform it live on stage, but it felt like a weird place to insert it. It seemed to drag on for too long, and kill any kind of buzz that had been building from the previous three speakers. After the Nemesis finally ended, the second pre-recorded presentation of the day was shown - Maz Jobrani, stand-up comic. Definitely funny and entertaining. Inspiring? Not so much. The next live speaker however was very inspiring - Joaquin Zihuatenejo, an English teacher who grew up in a Dallas barrio, who spoke of salvation being found in words. He received the final standing ovation of the day. From the high-energy and excitement of Zihuantenejo's speech, we went to the slow, low-energy speech by Flint Sparks, zen psychotherapist. He discussed taking time to pause, reflect, and connect. Gotta admit, I wasn't the biggest fan of his speech. He was followed by another bald man, Gary Thompson, "business-artist" and co-founder of Cloud Inc. I also wasn't the biggest fan of his presentation, as it came across as a bit hokey, and not moving, as he probably had intended it to be. Peter Hall, a design professor at UT was next, and he spoke about maps, mapping, and the mapping process. The question he said we should ask about a map is not whether it is a good map, but what was the process behind the creation of the map? "Always make maps, always question maps." Professor Hall was followed by Dr. Lionel Tiger, the man who first coined the term male-bonding, and who wrote the book "The Decline of Males". His presentation was probably the most polarizing. While he did indeed seem to ramble and jump all over the place, his basic premise is that feminism and its fight against what it considers the patriarchal system in society is what has resulted in the problems we are seeing in boys today, and also the amount of medicine prescribed to young boys. He discussed how the University of Toronto has 40 courses on female studies, but only 2 on male studies - one on homosexual males and one on transgendered males. The male species is under attack, he argues. As you can imagine, that didn't go over too well with this crowd. He received a standing ovation from 1 person, I believe. No it wasn't me, although I do believe his theory carries weight. After that was probably the best speech of the day, and it was a recorded one, from last year's TEDxHouston. Dr. Brene Brown, a researcher, spoke on vulnerability and the need for it. She states that we do our best to numb vulnerability. We are the most in debt, obese, sedated cohort in human history. However, she argues that we cannot selectively numb vulnerability. But in our attempt to try, the result is that we numb everything. We make the uncertain the certain, we perfect, and we pretend. Quite eye-opening. I had high hopes for the last two presenters, but felt like they didn't have any practical takeaways. I learned from Tavo Hellmund, the entreprenuer and former race car driver, who is bringing F1 racing to Austin, that his grandfather said to "never judge a man by the size of his wallet, but by the quality of his relationships with his family, friends and community." and to "Never be careful, always go for the edge." Finally, from Dustin Haisler, former CIO of the city of Manor, and still only 24 years old, to get engaged with government, a very similar message but much better presented by David Cameron earlier in the day. Following Mr. Haisler was a happy hour time, which I didn't stick around for, as my family was anxious for me to get home "Right Now", after spending the entire day away. Too many interests, not enough time.